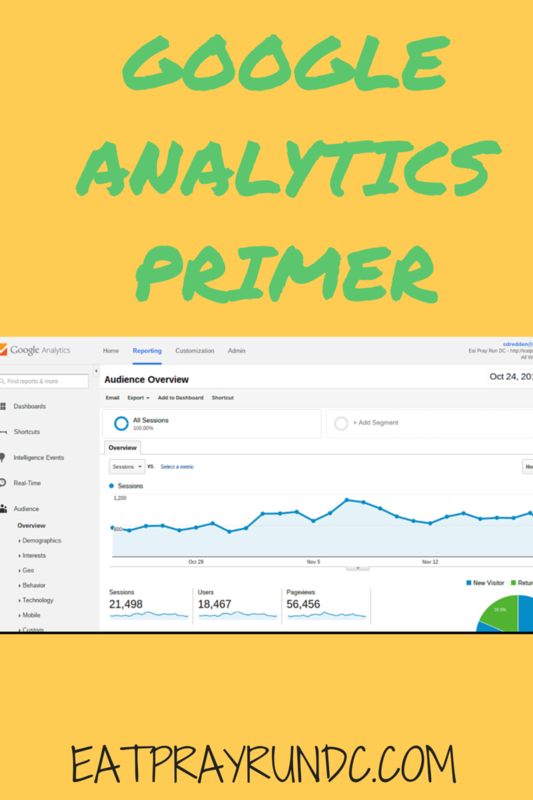 For this Google analytics primer, I want to start at the very beginning. First, what exactly is Google analytics? Google analytics is a service offered that offers statistics on website traffic and demographics. Anytime someone asks you for your stats, they probably want you to share your Google analytics – it’s pretty much the gold standard in terms of blog and website statistics. So how do you get these stats and what do the terms “sessions” “users” and “pageviews” actually mean? I’m glad you asked! To be able to access Google analytics on your blog, you’ll need to first sign up through the GA website. Once you’ve signed up, you’ll connect your blog to GA and after you go through those steps, you’ll be given a code that you’ll need to add to your blog – this tracking code is a must. Yes, this means that you must be self hosted — if you’re not then you can’t add the code to your blog. If you are thinking about switching to self hosted, I strongly recommend it. BlueHost is going to be running some amazing sales that I’ll be posting about later this week! Users – this number represents the number of unique visitors to the blog within a particular time frame. Sessions – this number represents the different visits by all users. If a user is idle on the blog for more than 30 minutes, that begins a new session. So if you visit the blog at 10am and then come back to the blog at 2pm and then again at 10pm, that would count as one user and three different sessions. That’s why the number of sessions is higher than the number of users. Pageviews – is pretty simple. It’s the total number of pages viewed during a particular time frame. Those three indicators are the most common and basic way to use GA. Understanding those numbers is the place to start with GA – get familiar with them so you can then move forward to looking at more details. Stay tuned – I’ll continue the Google analytics primer over the next few weeks! Great primer! I know it was terminology overload when I first started. I would eventually like to venture out into the world of customized reports. Keyword behavior is pretty fun as well. yeah – i’m working on getting familiar on a more detailed level! Hmm, is there a difference between GA and GA primer? start with the basics – what’s in this post! I do use google analytics…it is very confusing to me, so this was a big help. Thanks! it’s strange that for a google product i don’t find it it to be intuitive at all! Courtney, I have learned so much from you about blogging; I did finally add the GA code to my blog when I changed the design a few months ago, but I don’t check it as often as I should. I can’t wait to hear more on this; your posts are always so informative! Thank you! there is so much to explore – i’m learning as i go! Tara, so does that mean you’re self-hosted as well? I’ll definitely sign up after reading this. Thanks! you’re welcome – hope it’s helpful! i’m sure this will be super helpful for folks – thanks for sharing! I use it but of course still learning! I am still with Blogger and need to move over to Word Press but I don’t know how to. If you know anyone that can help me I would greatly appreciate it! Thanks Courtney for all your tips! Daisy @ Fit Wanderlust Runner recently posted…The Best Running Signs to Motivate You! i think there are a ton of guides for that online if you google. also sue at this mama runs for cupcakes did it pretty recently! Thanks, Courtney! I’m starting to think about self-hosting, but I feel like I should have more readership to do so. Is that a legitimate concern? GiGi Eats recently posted…Maria Menounos, Thank You! Oh, thank you for this! I signed up with GA about a year ago, got frustrated, and never went back. Now I’ll be loaded with the tools I need to figure it out. Yeah, there’s so much there but it still sometimes mystifies me!